This past year I was lucky enough to travel through 13 countries, and loved every one. 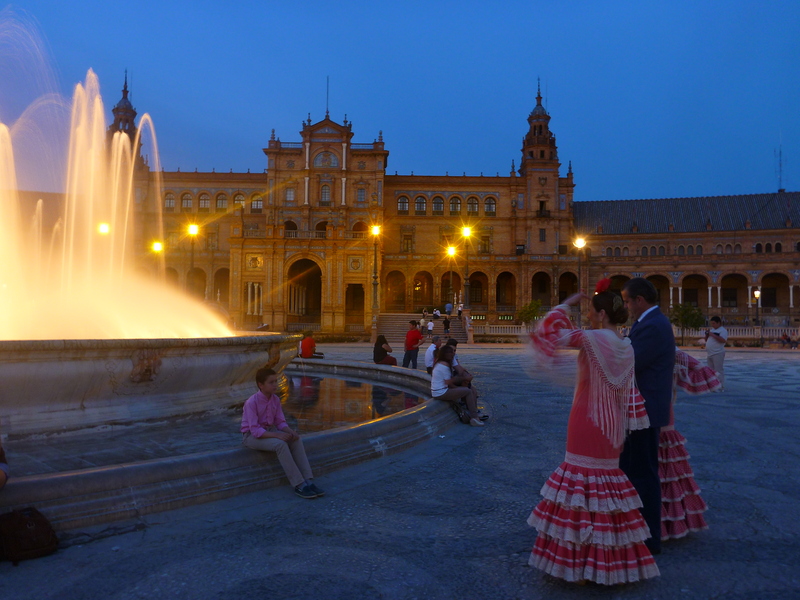 I always have a travel wish list, but as I tick each item off the list it only grows longer. So before I think about my wish list for 2016, I wanted to look back on my favourite places and experiences. 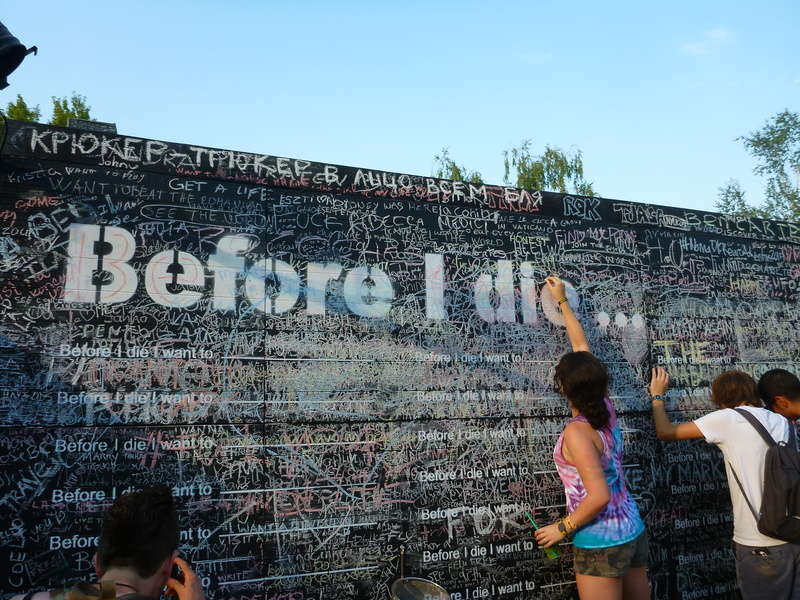 Here’s some 2016 travel inspo for you. Hope you enjoy the list as much as I enjoyed making it! 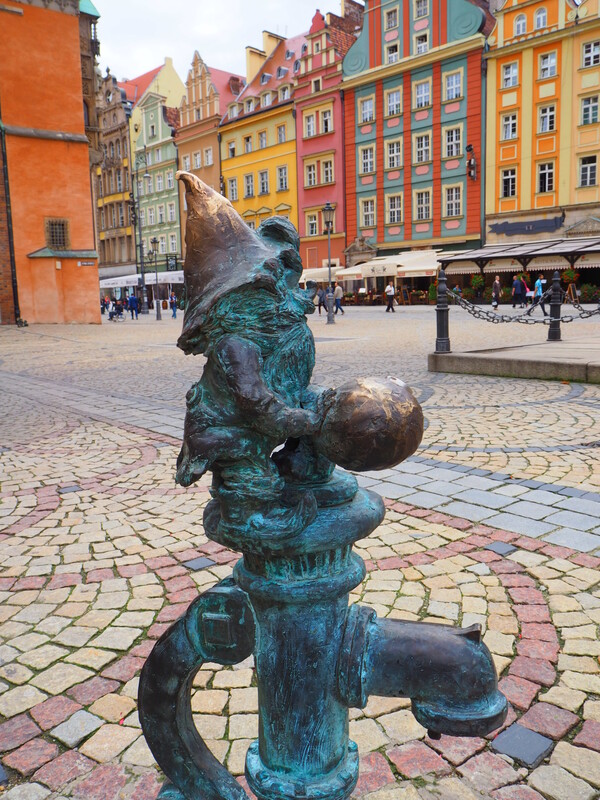 Welcome to the city of gnomes, where a wander through one of the most stunning city-squares in Europe will bring you into a world inhabited by adorableness. 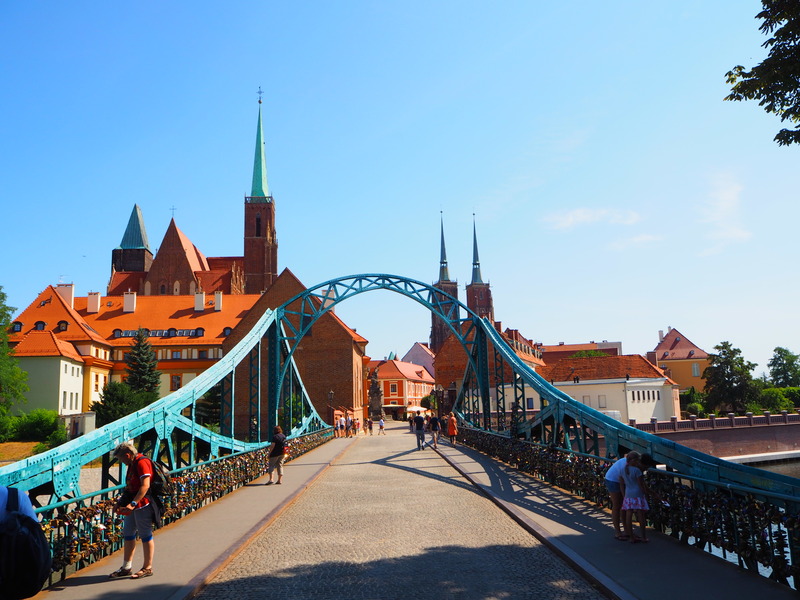 I first wanted to visit Wroclaw when I read about it on World of Wanderlust. 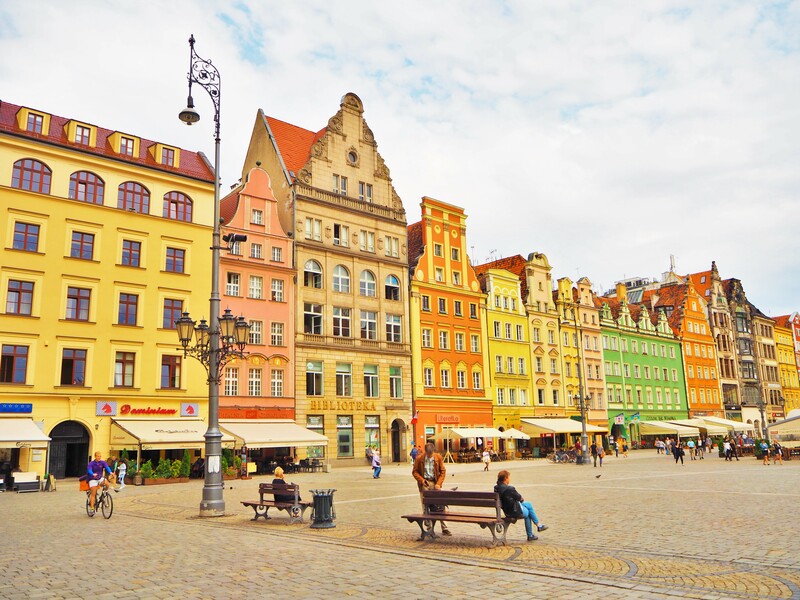 Despite the seemingly unpronounceable name- I seriously struggled to get my bus ticket there because I couldn’t tell them where I needed to go- Wroclaw (Vro-tz-wav) is one of my new fave places in Europe. 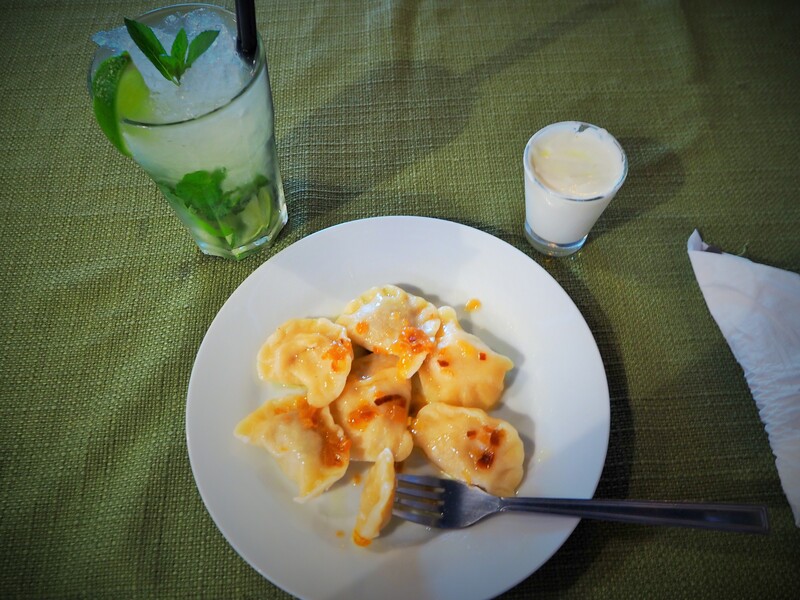 It is located in the North-West of the most wondrous Poland, home to glorious architecture, DELICIOUS foodstuffs, incredible sights and great nightlife not to mention being one of the cheapest places in central Europe. 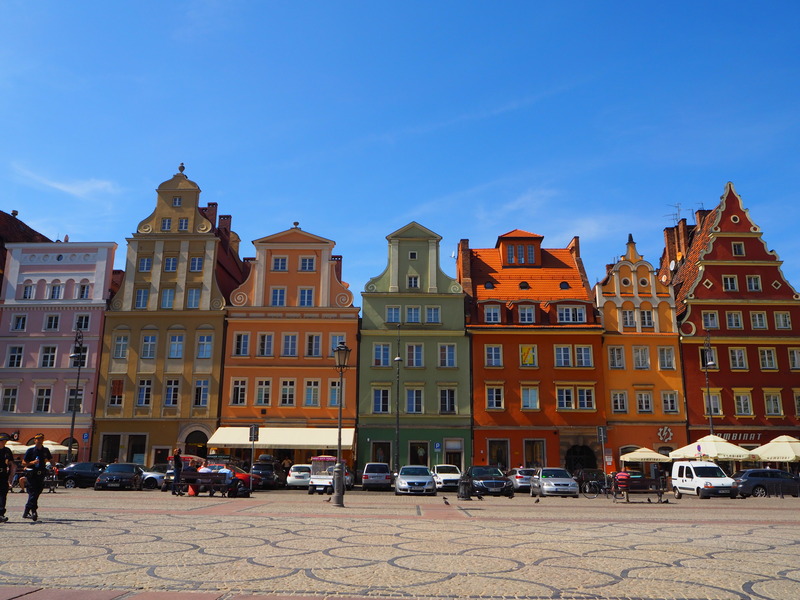 But Wroclaw is a destination unto itself, and I could barely contain my scary-huge smile when I stepped into the main square. 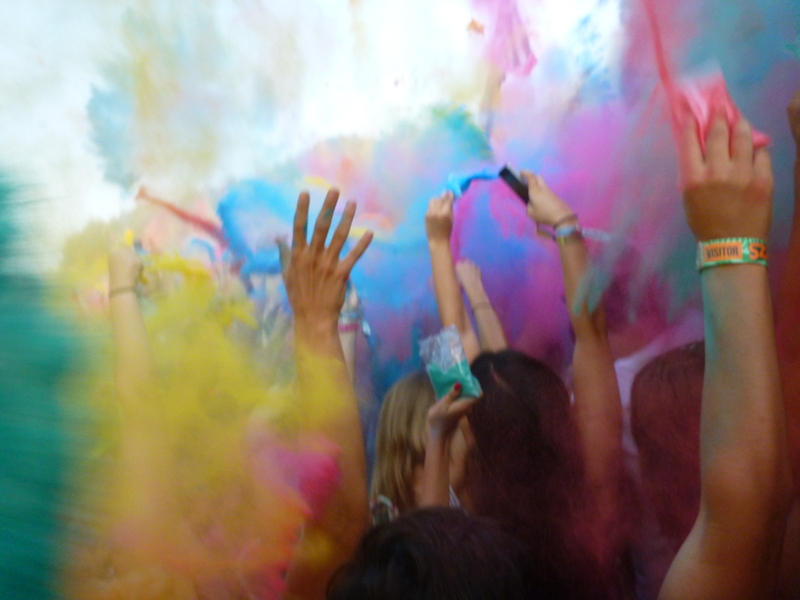 Needless to say you could not see my face the entire time I was there because it was behind a camera. I kept thinking THAT is the prettiest building I have ever seen, and oh look an adorable gnome pumping some water, until I turned around and saw an even more impressive testament to pre-war architecture and an even cuter gnome, this time skipping along with other gnomes. 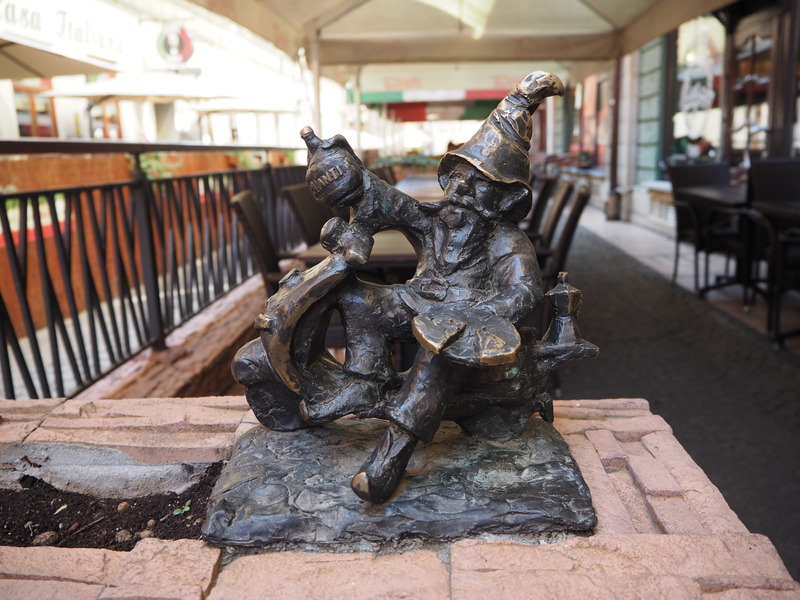 The gnomes themselves started appearing in the city as part of a movement of resistance against the communist regime, a tradition that had continued and become a part of the city’s identity. 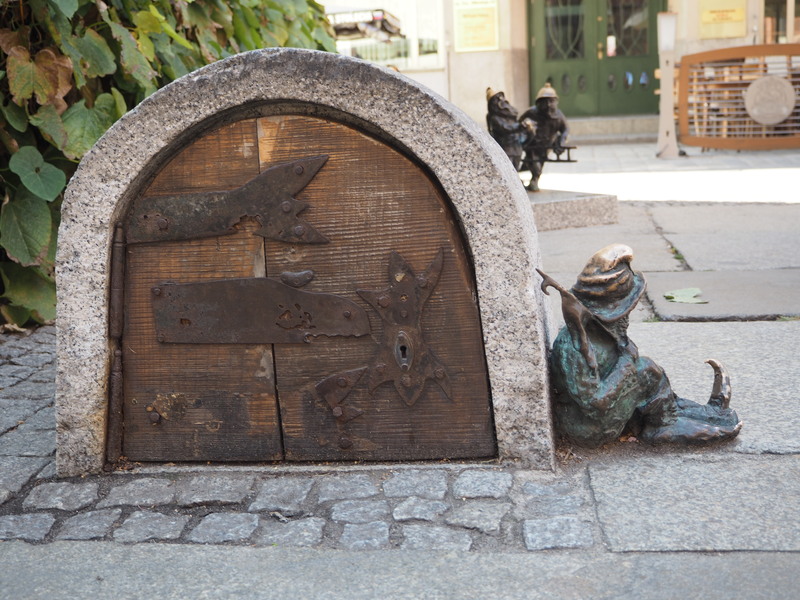 Around 300 unique dwarf statues can be found around the city, and while I spotted quite a few wandering around and on my walking tour, I wish I had time to do one of the dwarf-spotting tours. Aside from amazingly colourful buildings and gnomeish adorablenosity Wroclaw has yet another rather unique site- an entire island dedicated to religious worship (not to be confused with every island nation ever). The Cathedral Island is a part of the main walking tour as well, and has 3 churches and around 1500 inhabitants, making it a pretty peaceful end to a tour of the city. While it is not technically an island anymore the main access is across the ‘Lover’s Bridge’, filled to the brim with locks (which my tour guild informed us were all about to be removed!). 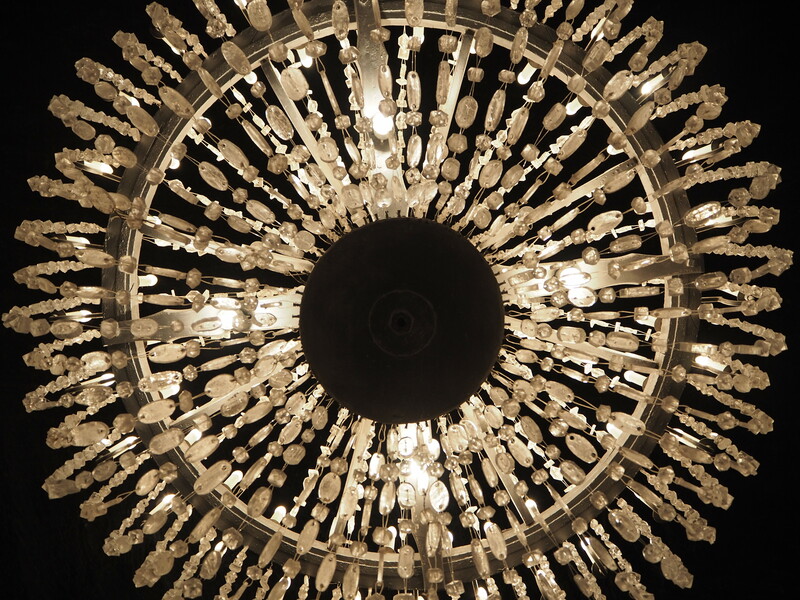 While there is a decent nightlife in the city, I did not imbibe as I was still fighting off my death-cold from Budapest. Instead I had an incredible time with me, myself, and Pierogi, in-between wandering the stunning streets and searching for gnomes. 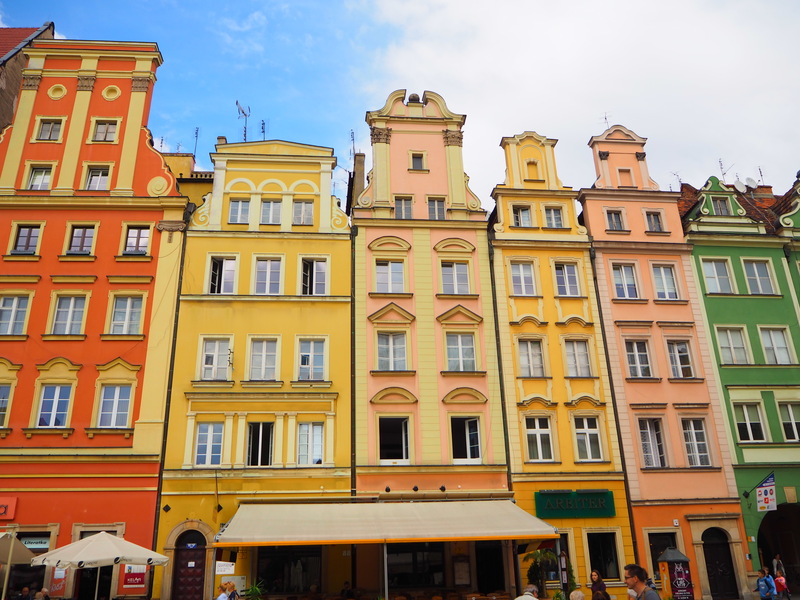 There is so much to enjoy about Poland in general, but I think Wroclaw has to be one of the most unique and interesting places I’ve visited. 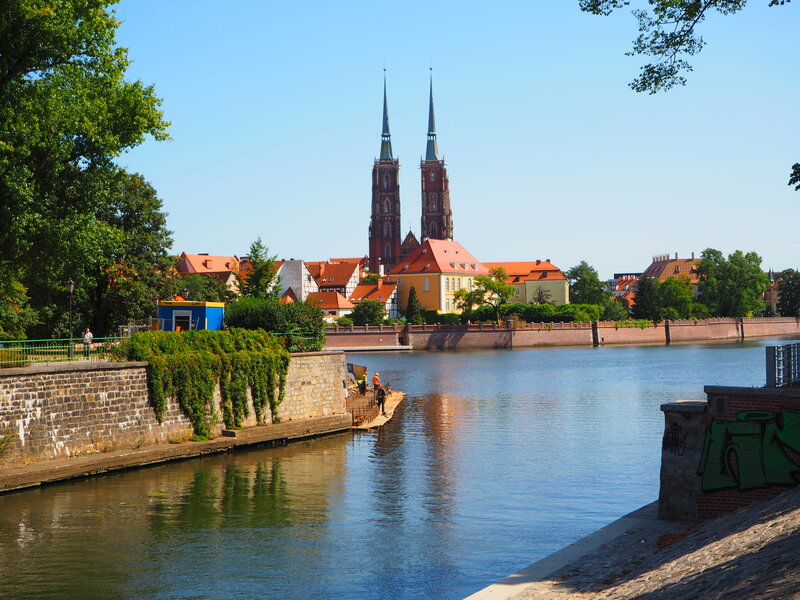 Have you ever been to Wroclaw? 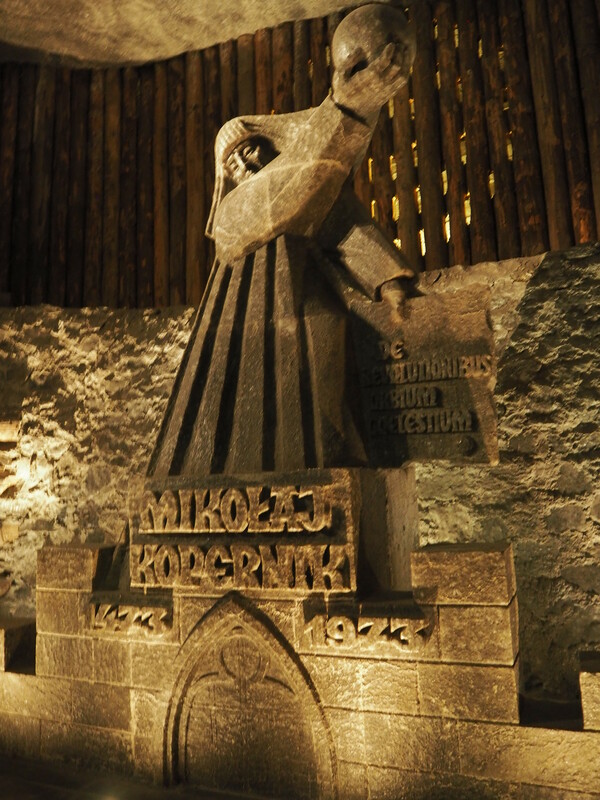 Where is your favourite place in Poland? 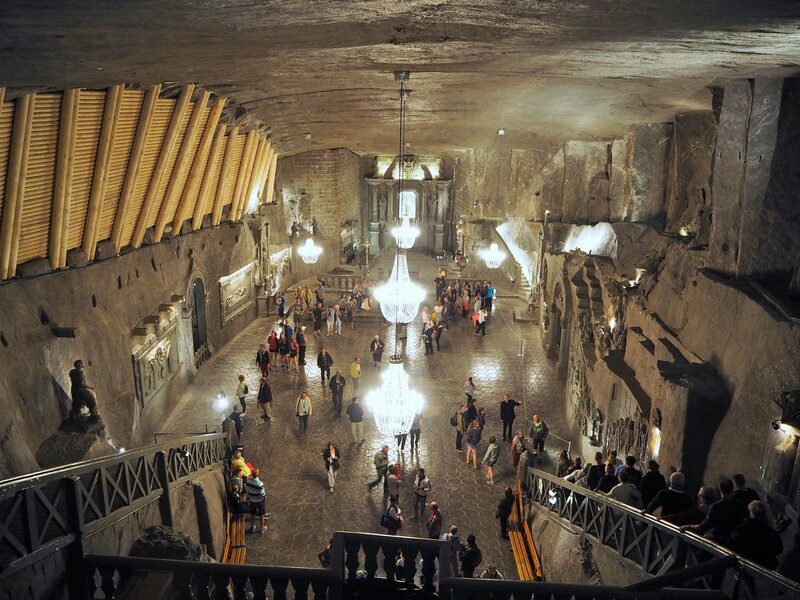 Before I saw the Wieliczka Salt Mines outside of the Polish city of Krakow, I wasn’t actually that interested in going. But there are two main things to do in the city (other than eat mounds of Pierogi) and Aushcwitz was too emotional to do again. 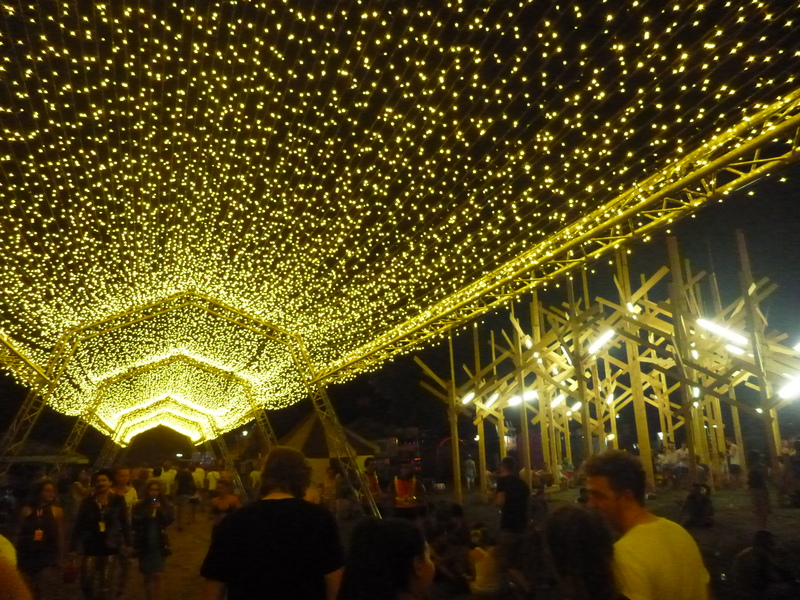 Also, I was coughing up significant portions of my lungs after being at Sziget festival for a week and had heard the salt mines were good for what ailes ya. 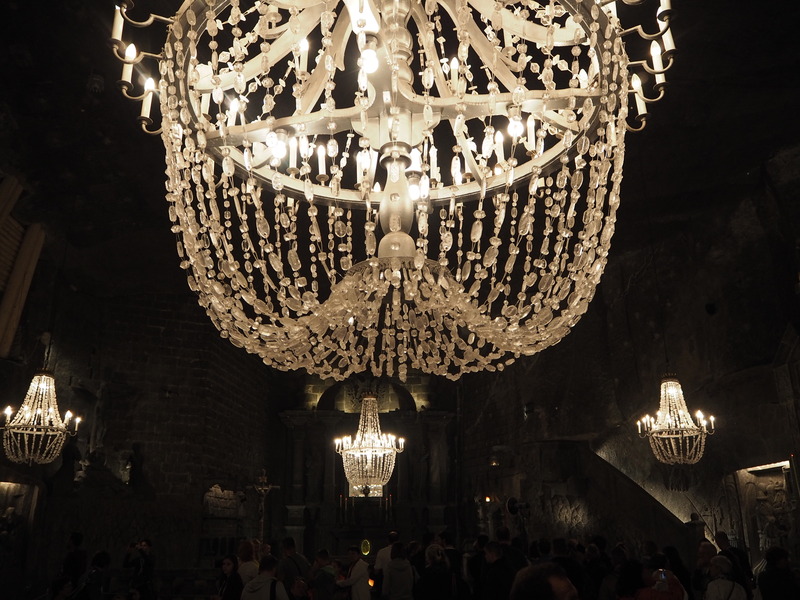 *** I’m uber glad I gave them a go though, as seeing an entire cathedral made of nothing but salt and being taken back in time to where miners crafted such things for themselves was a wonderful experience. 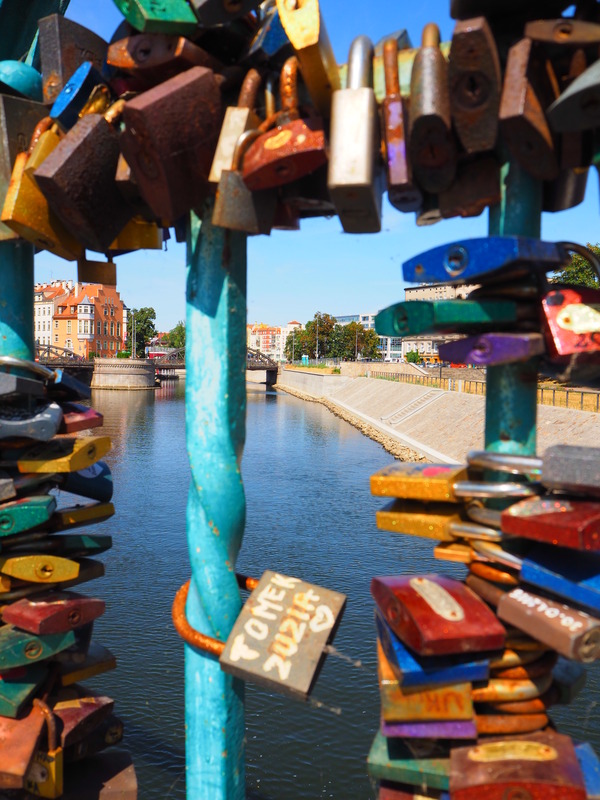 It’s also an easy breezy day trip from Krakow at just 15km from the city. 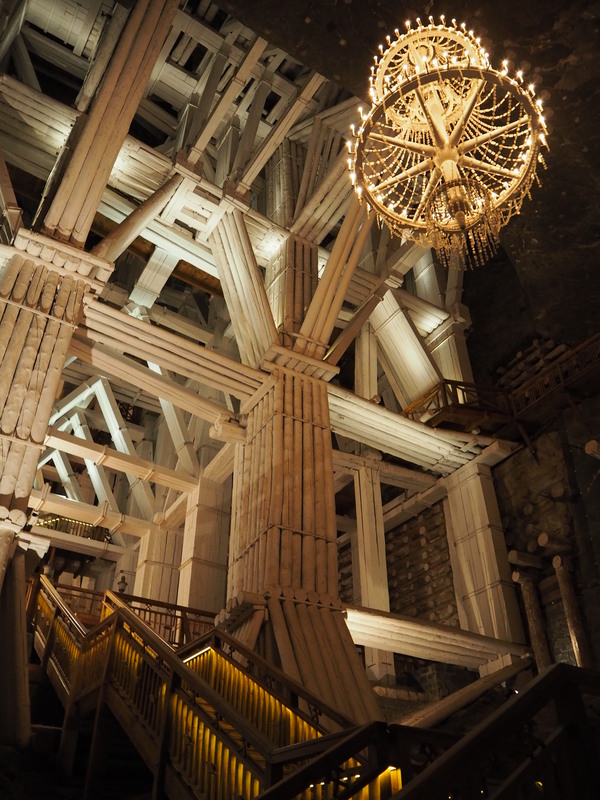 After a shortish bus trip the tour of the salt mines takes to this fabulous invention, the never-ending staircase. Well, it seems like that when you need to descend more than 50 flights of stairs (350 steps) to begin the tour. I took the classic tourist route, but those with more adventurous plans and more forgiving wallets can also take routes that allow them to be miner for a day or explore much further into the mines. My tour began with being told that what you will see is only 1-2% of the actual mine, and for that reason shouldn’t wonder off unless you aspire to live a very salty and lost existence. 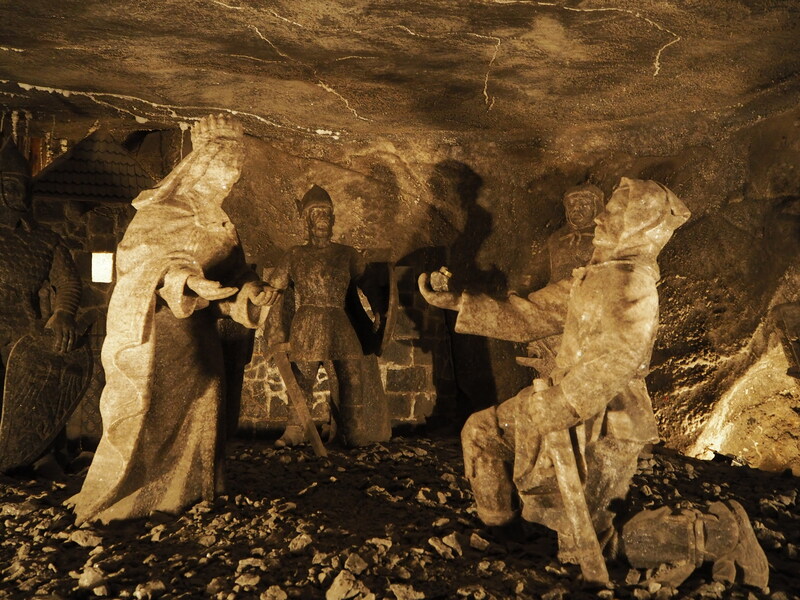 You are lead past sculptures of Poland’s great academics, the famous polish gnomes and tableau’s depicting the legend for which the Chapel, the main attraction of the mines, was named. 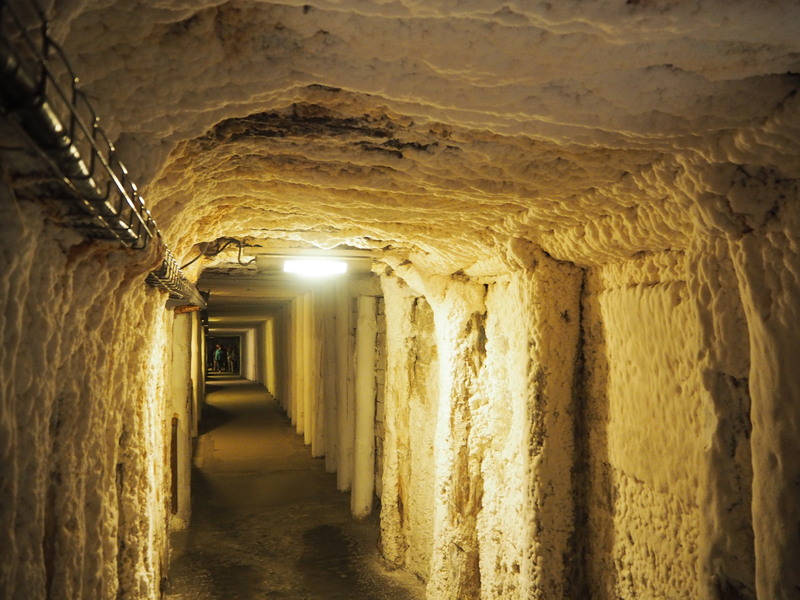 You are lead through narrow tunnels made entirely of salt with the exception of wooden support beams, also entirely encrusted in and preserved by the salt and several hundred years old. 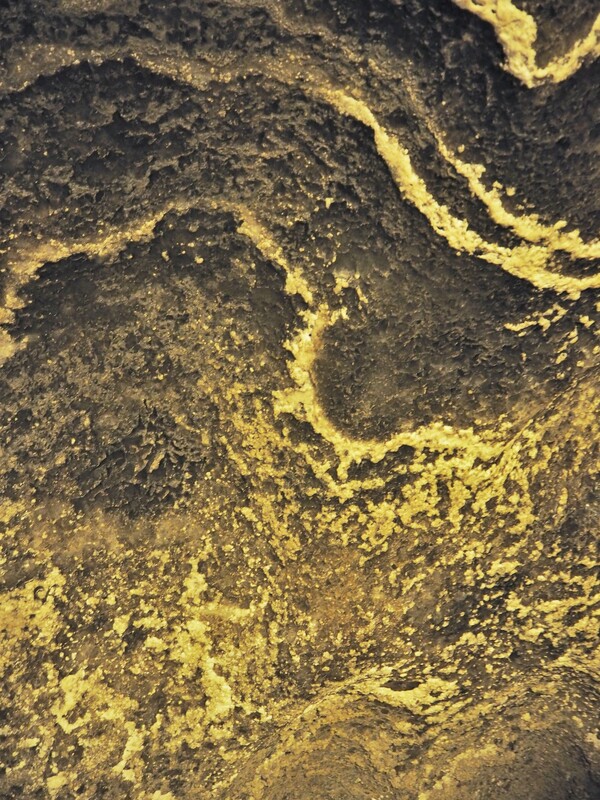 You will be invited to taste the salt the walls of made if, and differentiate when the floor beneath you in salt or concrete based on its shine. We were invited to taste the walls. Like a terrible version of Willy Wonka. 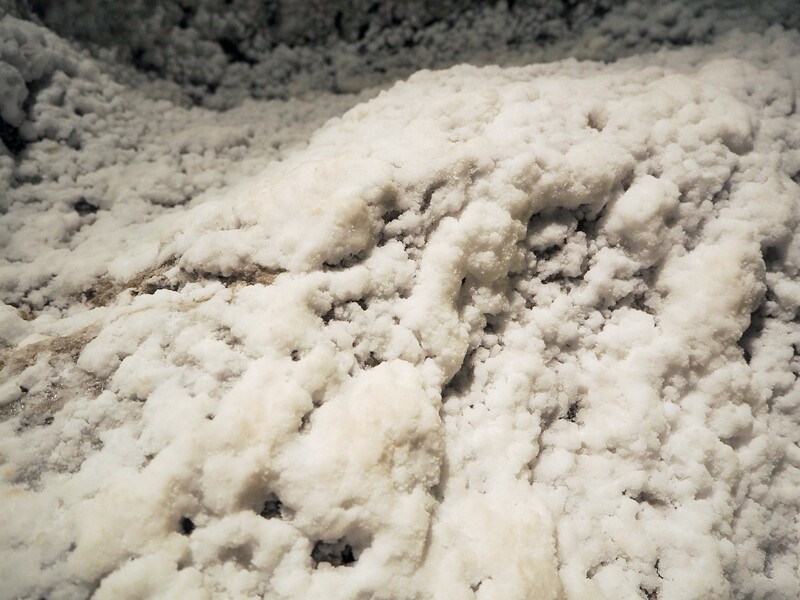 The air in the mines is said to help with respiratory ailments and allergies as a result of the unique micro-climate created by the salt. As I was bravely soldiering through my deathly cough at the time, i could be seen taking creepily deep breaths all through my visit, no doubt reminding others in my group of the mouth-breather who sat behind them at school. All in the name of health my friends 🙂 There is actually a dedicated health resort for people to visit, but not on this backpacker’s budget (I can occasionally afford to feed myself). After venturing through some more tunnels, sliding past a salt lake and tasting some of the salt-water (deep, deep regret) the tour ends with it’s prize gem in the chapel of St. Kinga, where the darker less-pure salt has been carved into an enormous cavern lined with wall etchings an intricately decorated with salt-crystal chandeliers, all at a depth of 101 metres. 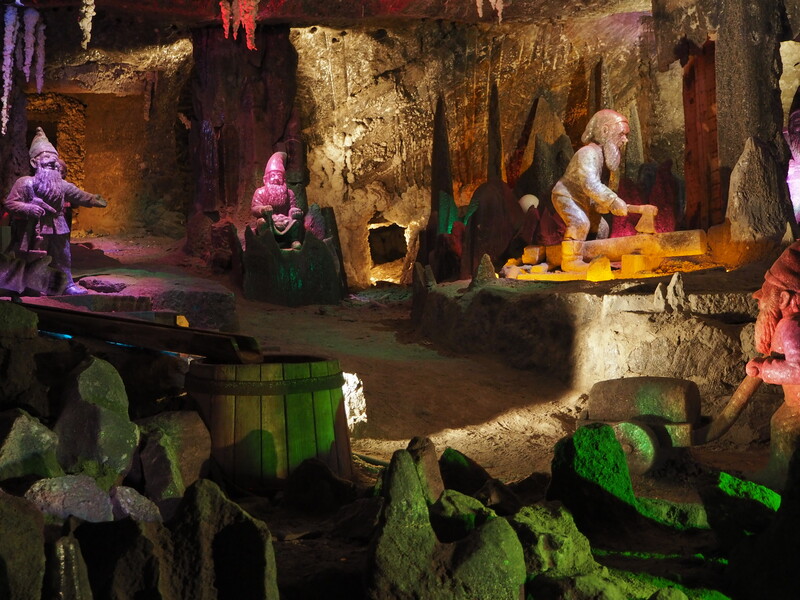 The mines are truly a unique experience, and have been a UNESCO world heritage site since 1978. While my visit didn’t necessarily cure my cough, it was an unexpected pleasure to see such magnificent scenery carved in such rare circumstances. 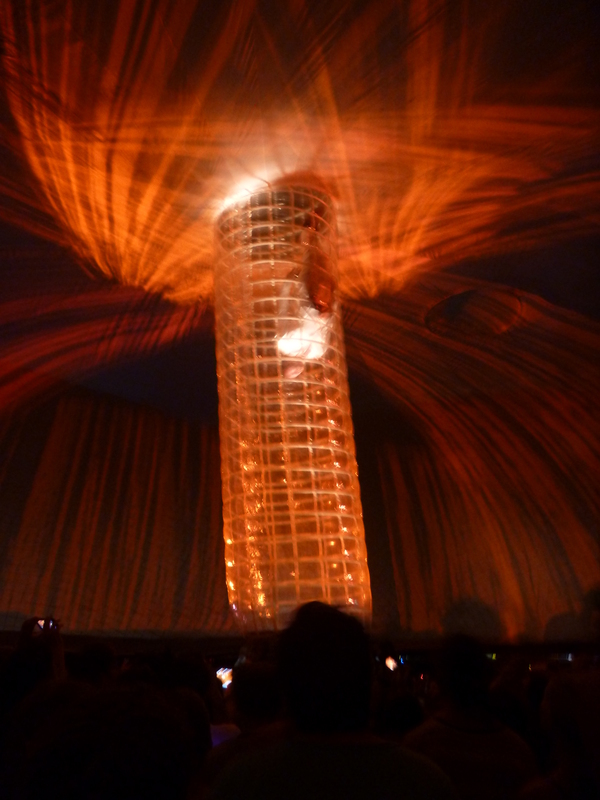 Add to that the artists were mostly the salt miners themselves and you can truly appreciate the beauty of these mines. ***Ok, maybe I wasn’t quite that sick, but I felt very bloody sick, ok?? 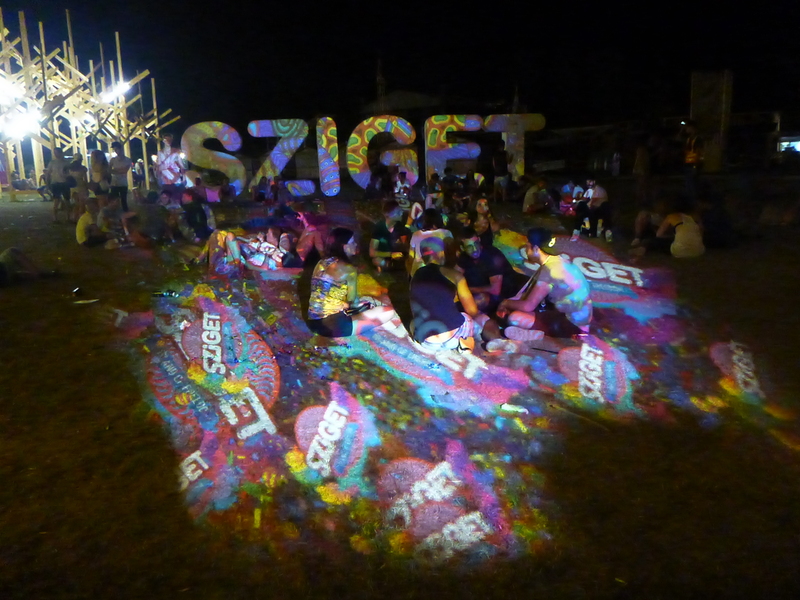 I first heard of the Sziget music festival while staying at the indescribably, ridiculously awesome Retox hostel in my favourite city in Europe- Budapest. 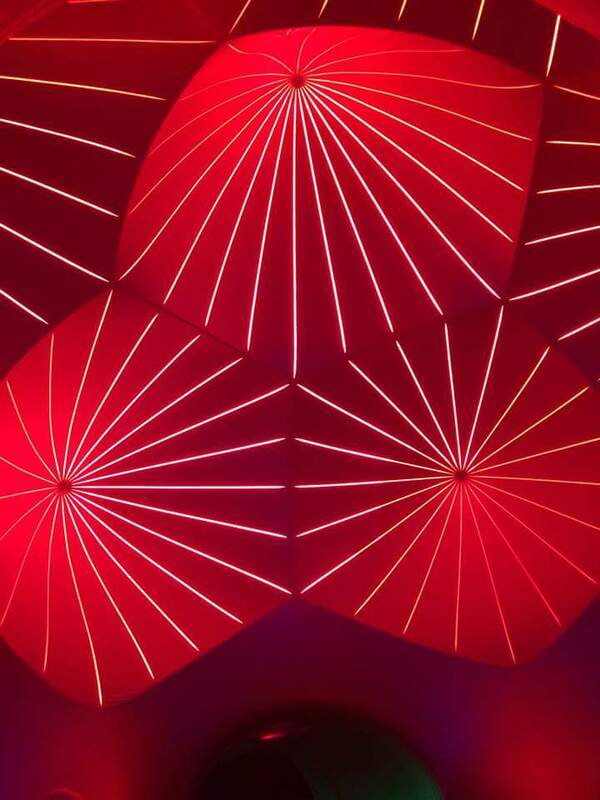 I was living in Europe at the time and had been to Budapest before, thinking that the party haven couldn’t get any better. 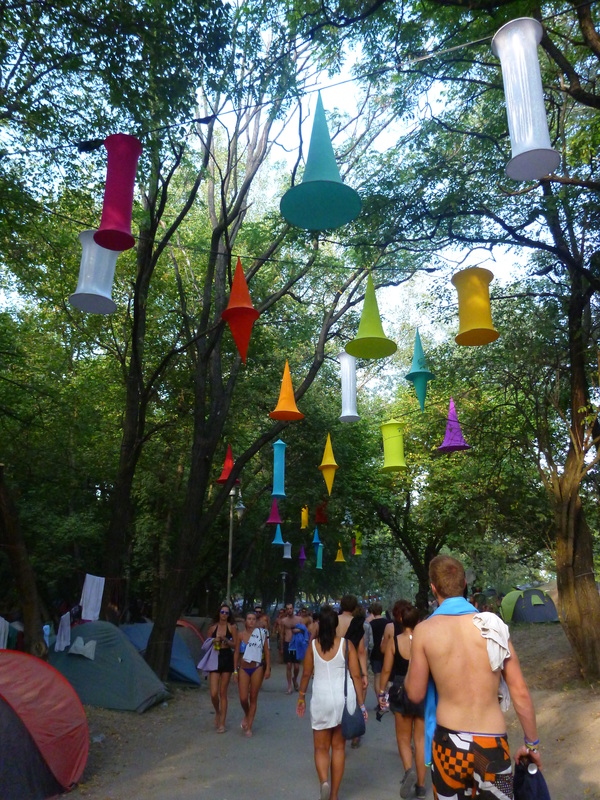 That was until I heard people talking about the upcoming festival (which I would be gone for). 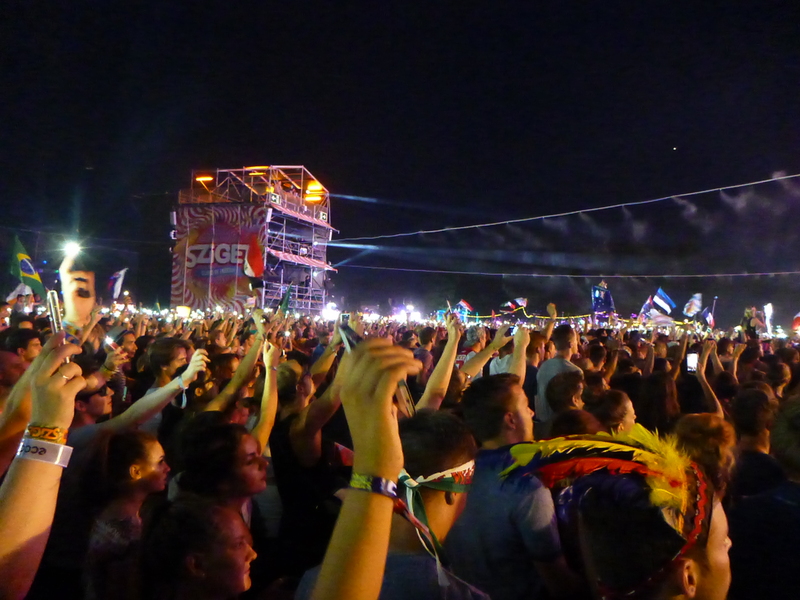 I remember talking to guy who worked as a Roadie, traveling the world with different concerts and festivals, who told me Sziget was the best one he had ever been to. 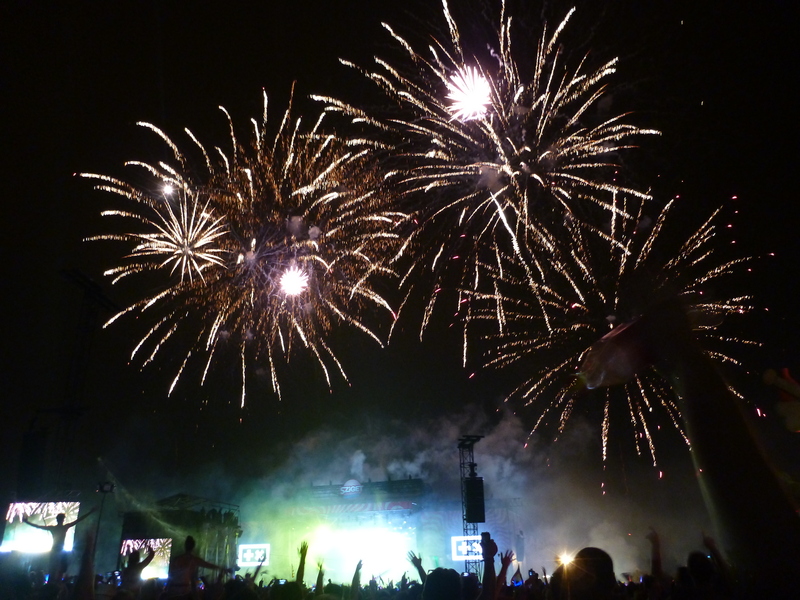 I vowed to one day return for this wondrous event, that the hardest partyers in Europe waited for all year, and this year I finally did. If you’ve never been to Budapest before, it is actually a city divided by the Danube River, with Buda on one side and Pest on the other. 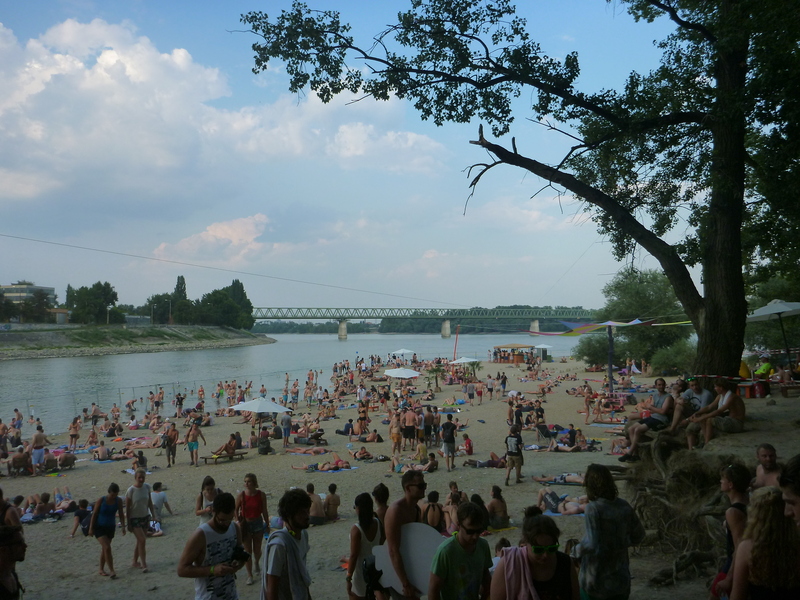 On this river there are several Szigets (islands), and one of the biggest is the location of the Sziget Music Festival, a 7 day event held in August every year in which around 80,000 tie-dye and fluro clad individuals head to the ‘island of freedom’ and go absolutely bonkers. 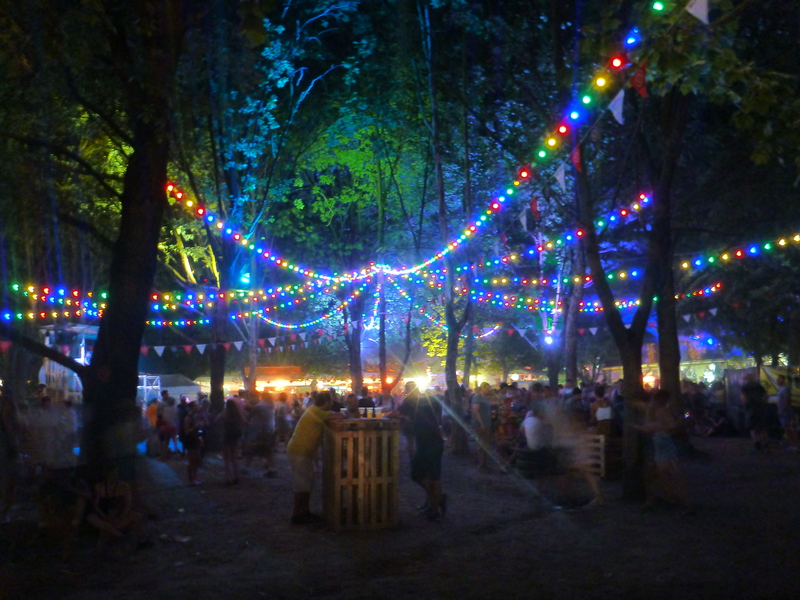 Sziget was everything I expected and everything I had no idea could happen at a festival. 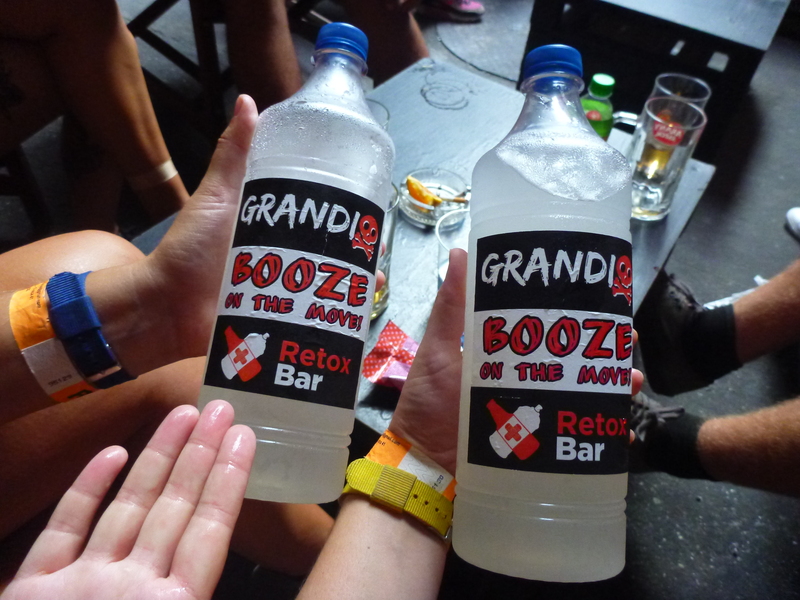 It wasn’t just the festival’s location right near the heart of city, meaning we could actually stay at the fabled and most drunkenly joyous Retox Party Hostel every night, and go with new friends from the hostel on a massive party bus to the actual festival. 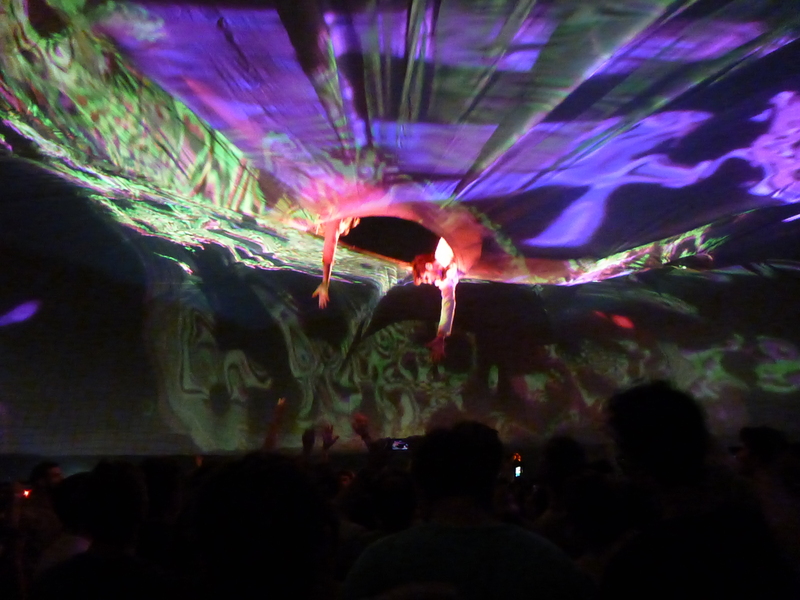 It wasn’t the line-up either, which was great but nothing special for a European festival. It was everything else that was around it. There were tea houses and volleyball and debate tents and marriage tents and all the food anyone could imagine and Alice in Wonderland themed bars. There was a full circus section with circus games, fortune telling and puppet shows, there was giant table setting complete with giant crib for people to play out all their weird fantasies. 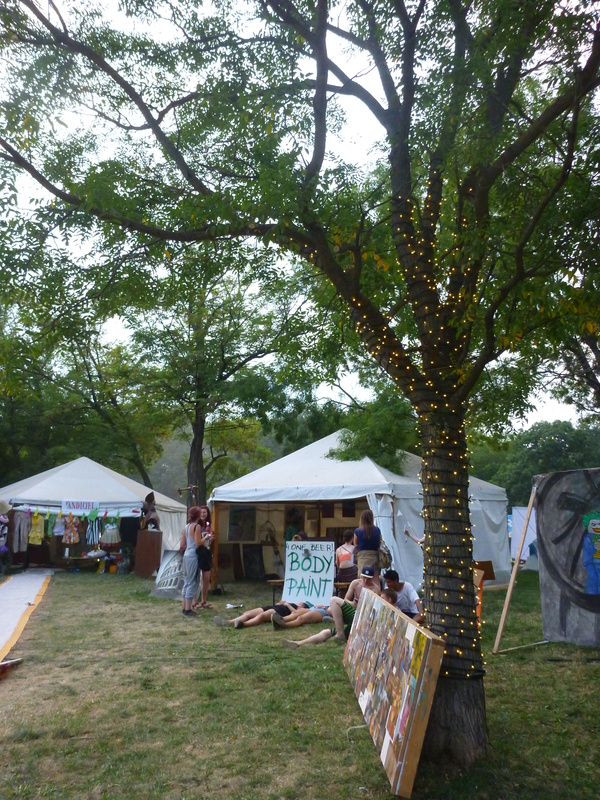 There were so many things to see we didn’t get to everything, and every time we thought we had the festival mapped in our heads we found a new section. 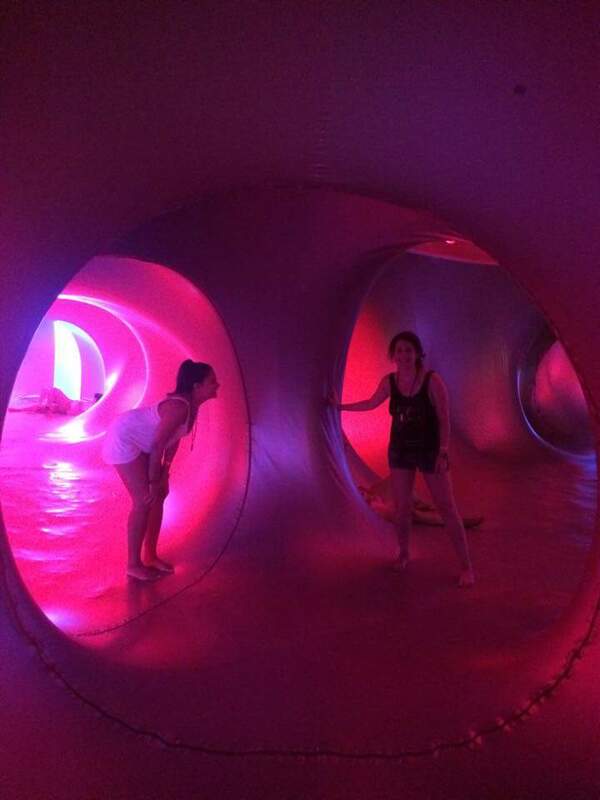 There was even an underground labyrinth of tunnels for crying out loud, but we never made it because we kept getting distracted by all the shiny things. Most importantly, there was no judgement, very few dickheads, and not a shirtless, overly muscled butthead guy looking for a fight to be seen. 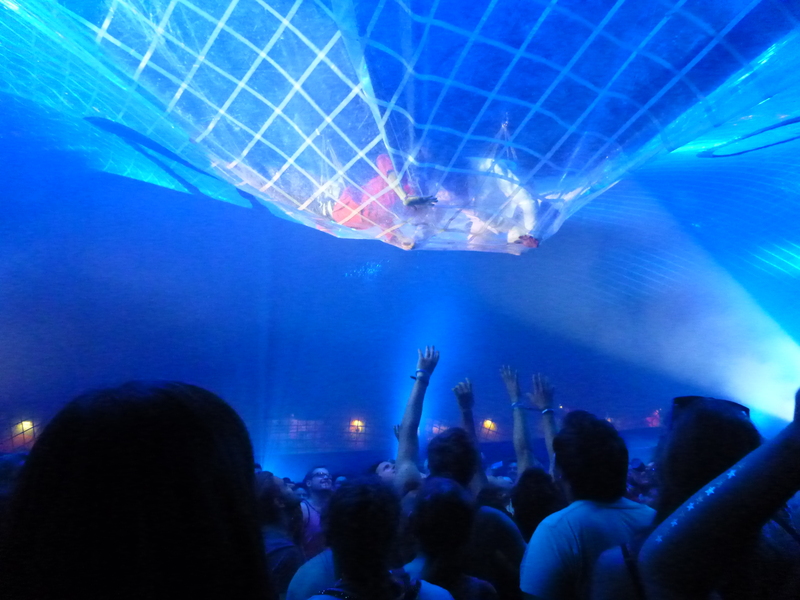 Just a lot of people dancing their faces off, and occasionally rolling around in mud (I did not partake). 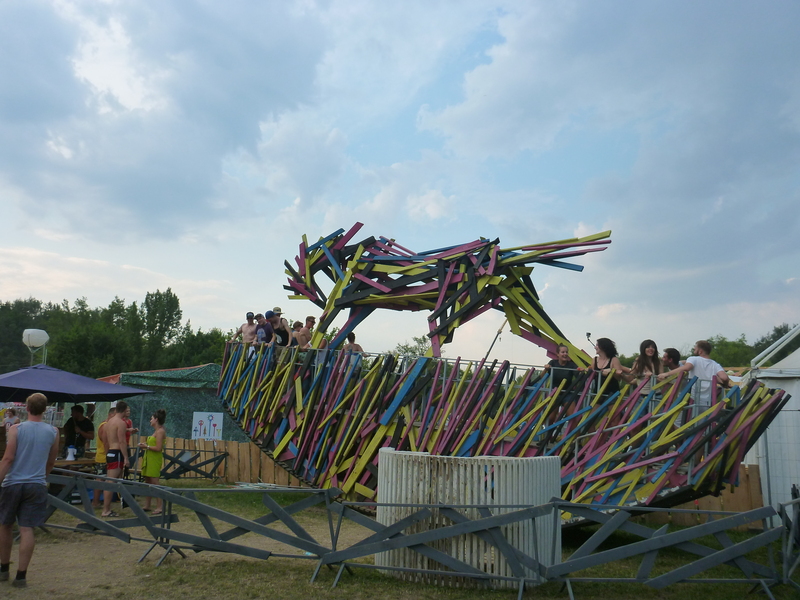 For an Australian, the 5 day pass I went for was about the same cost of a 2 or 3-day festival back home, while drink and food prices were the same as you any place in Pest. In Melbourne, you basically have to give over your first born to buy some crappy vodka pre-mix at a festival, so this left my friends and I pretty shocked (cut to us with 8 mojitos..). 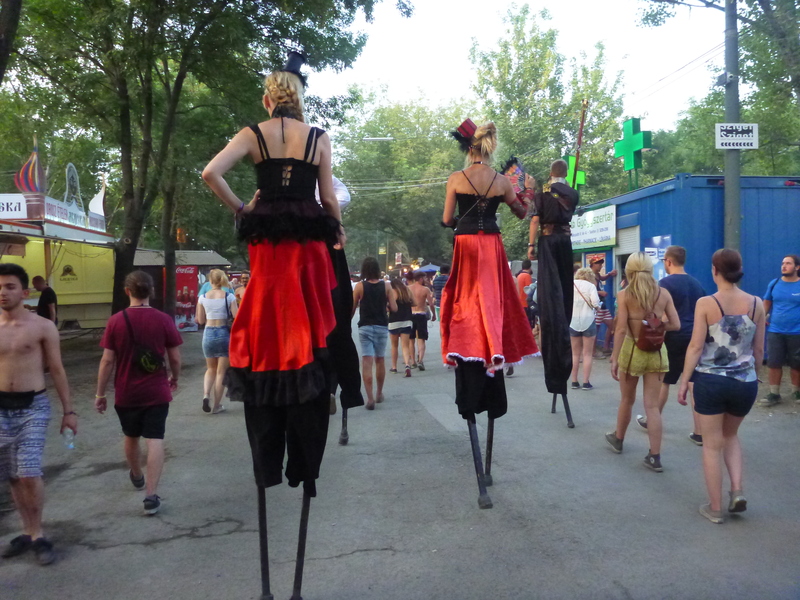 The music itself was awesome, but my favourites of the festival were pretty unexpected. While I knew Ellie Goulding’s songs before and liked them I was no devout fan, but she put on an awesome show, while her rendition of Your Song by Elton John actually gave me goosebumps. She was just a great performer, and while other acts I expected to really enjoy like Major Lazer and Kings of Leon and Milky Chance, they either performed well but had no stage presence or the other way around. 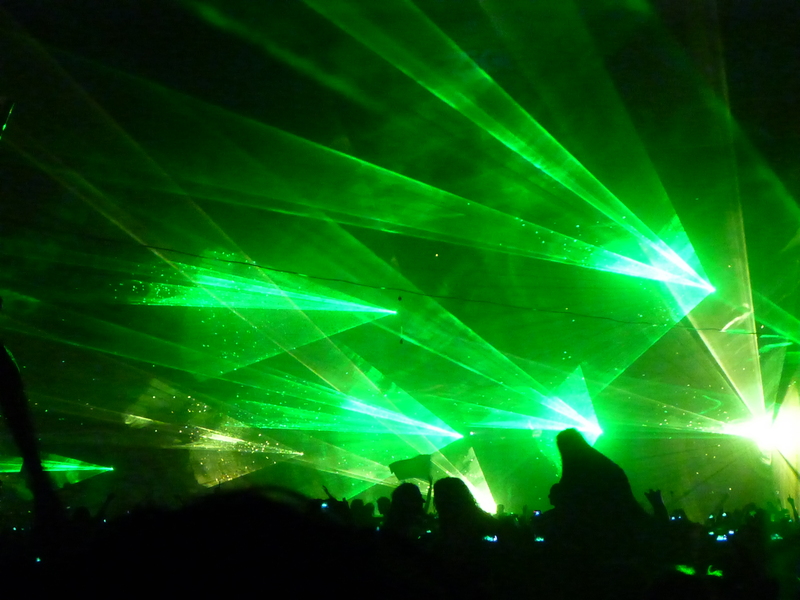 I had an amazing time at all of them, but nothing compared to C2C’s set for absolute boogy-ability. Maybe it was because it was the last day, maybe it was the rain, but I was dancing my tooshy of for every second of their set and absolutely loving it. Yasssss C2C are the besssttttt. 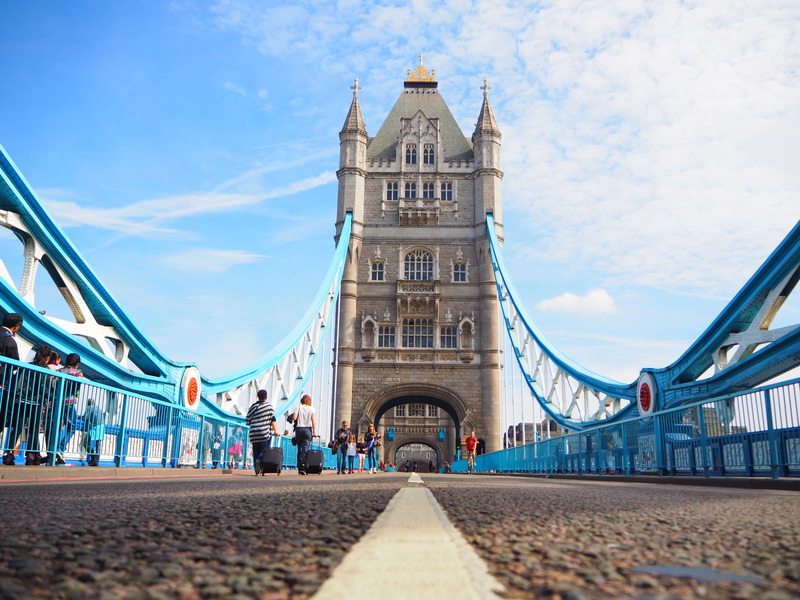 London is not usually my first choice for Europe, especially when the already high prices soar in the summer months. 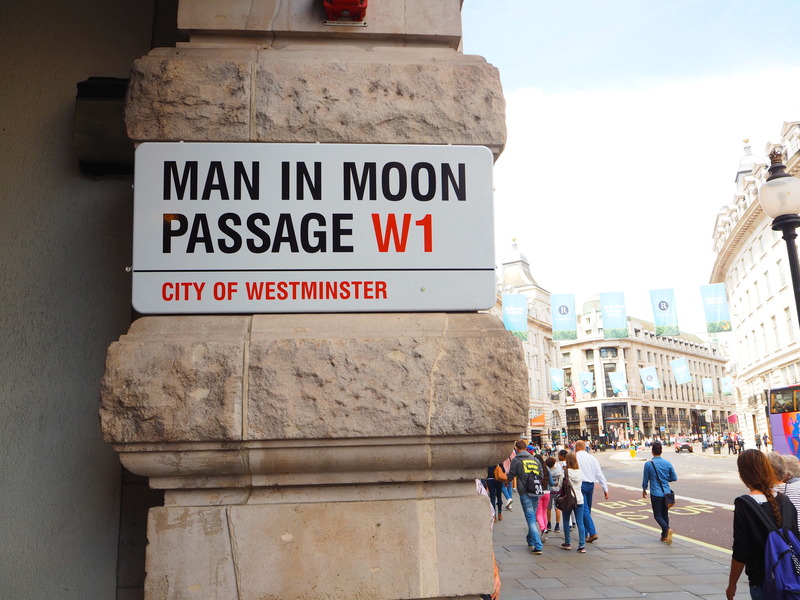 I had a stopover there for a few days though, and loved every second of it. 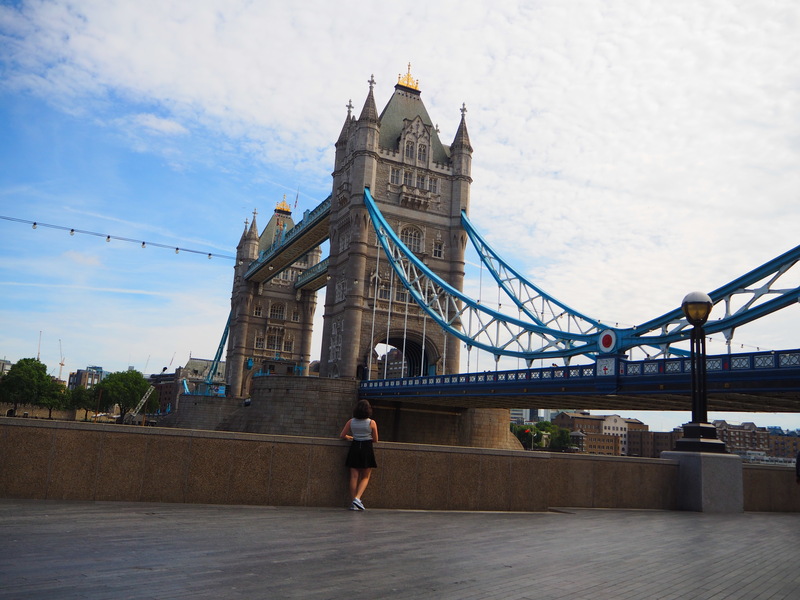 Aside from my love of tea and cheese being highly sated here, the architecture, markets, shows and museums are enough to keep anyone happy for a few days even on a tight budget. 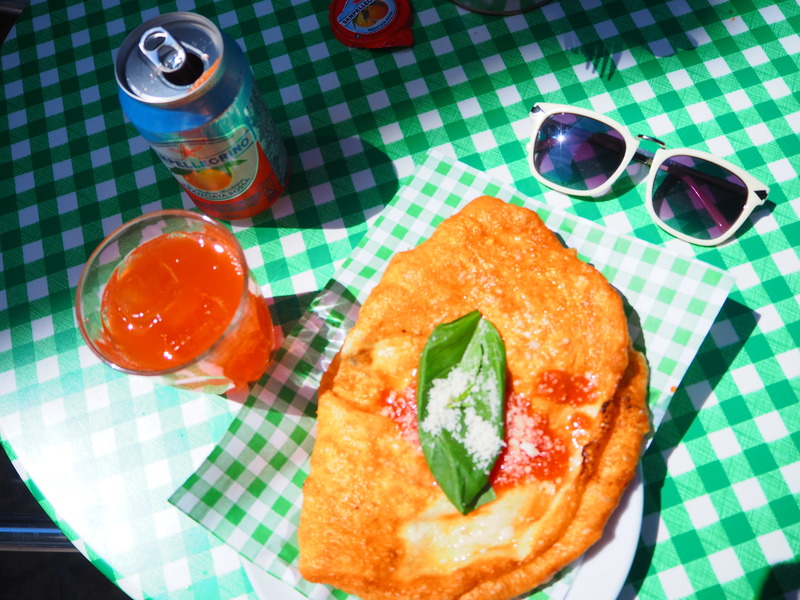 Of course the first place I come across in London is manna from cheese heaven. 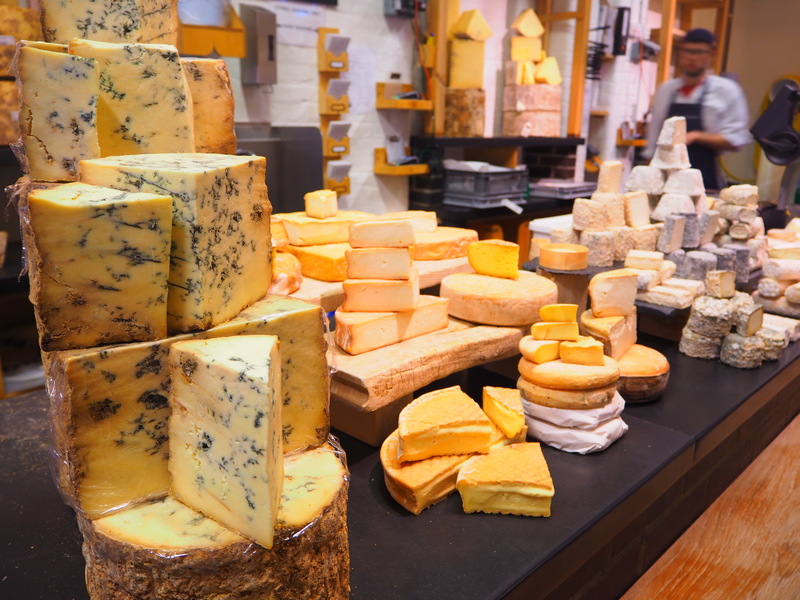 I was lucky enough to be staying a few minutes walk away from the awesome Borough Market which is full of amazing goodies, but I got a cheese version of highway blindness when I came here and started buying ALL THE CHEESE. Had a very happy next few days eating it all. 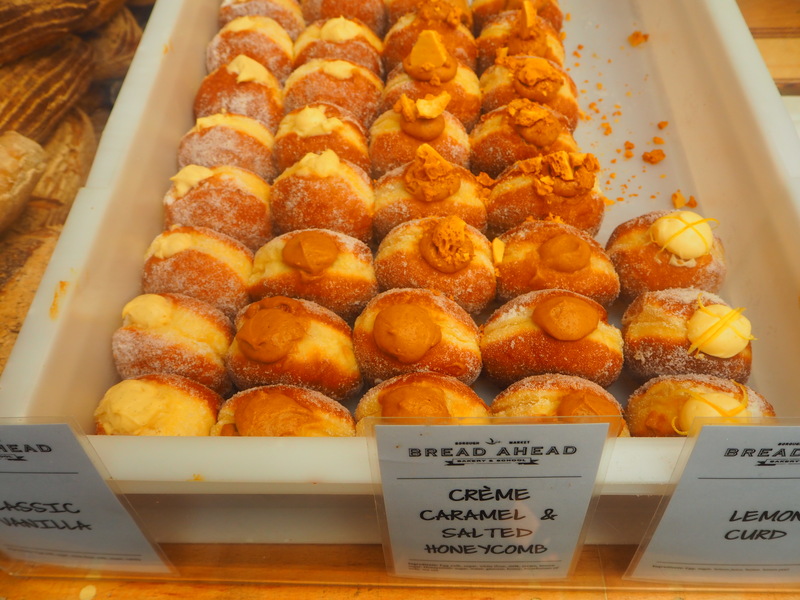 The Borough Market in London is full of all sorts of amazing food, and though it is pricey even for London, the quality of the good like these doughnuts from Bread Ahead is phenomenal. 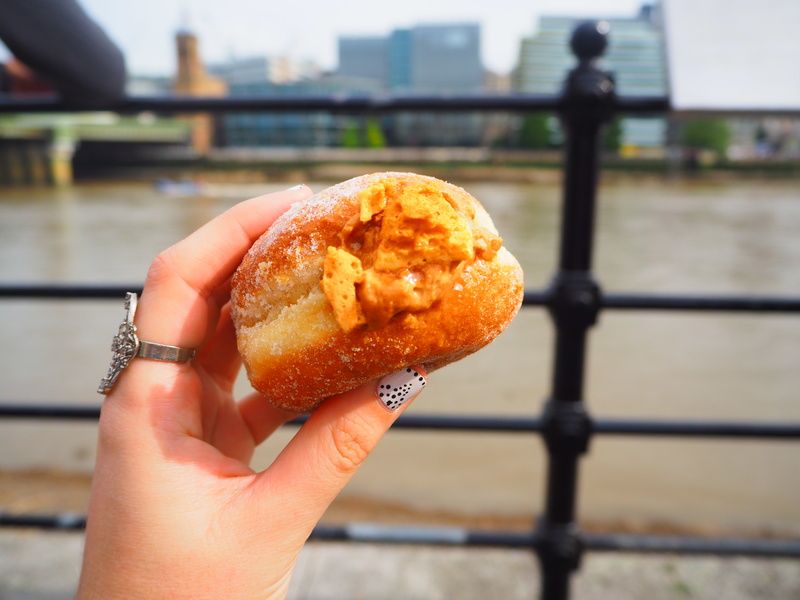 I grabbed this salted honeycomb number and from the nearby chocolate emporium and headed to the Thames to enjoy my breakfast of champions. 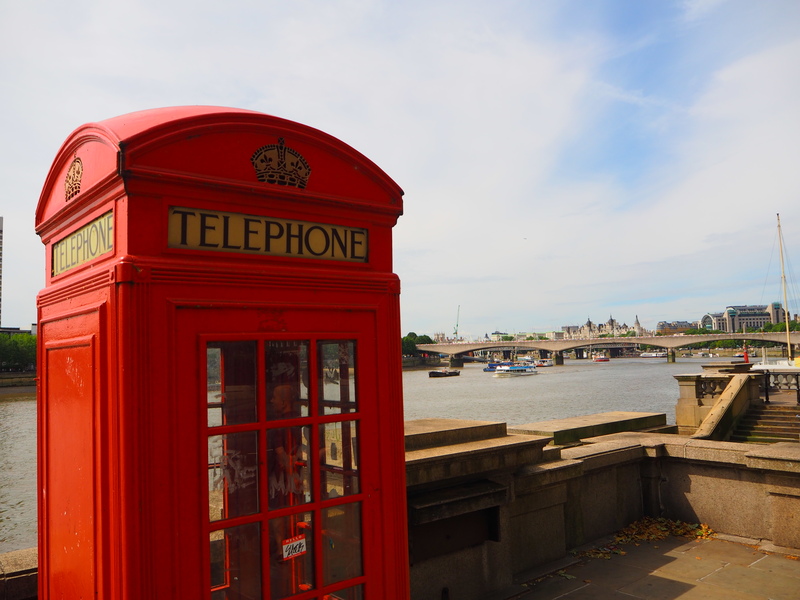 If you’re in London summer or winter, walking along and stopping for a bite along the iconic river is a must. 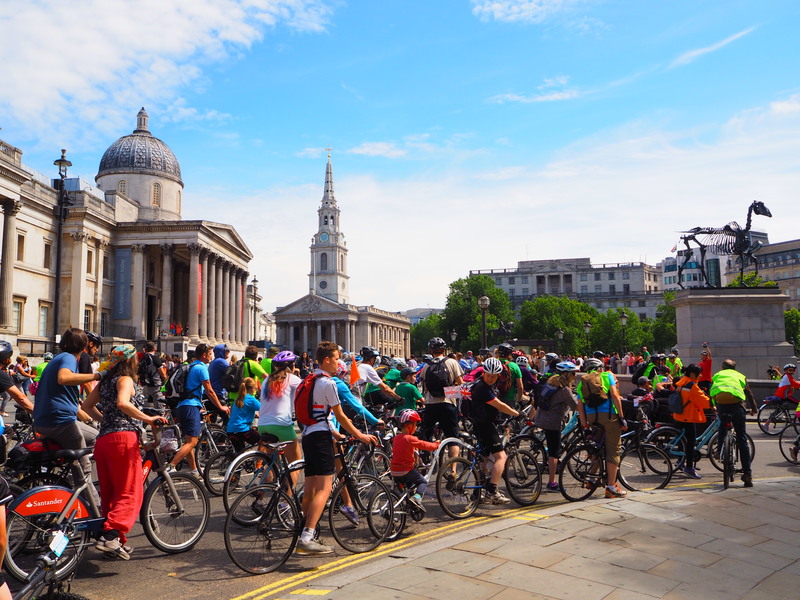 After walking along the Thames for a while and crossing to the other side, I came across some epic bike ride that seemed to fill every street I went down. I’m still not sure what it was but it was pretty cool to see that side of the city, everyone out and participating in such a huge event. 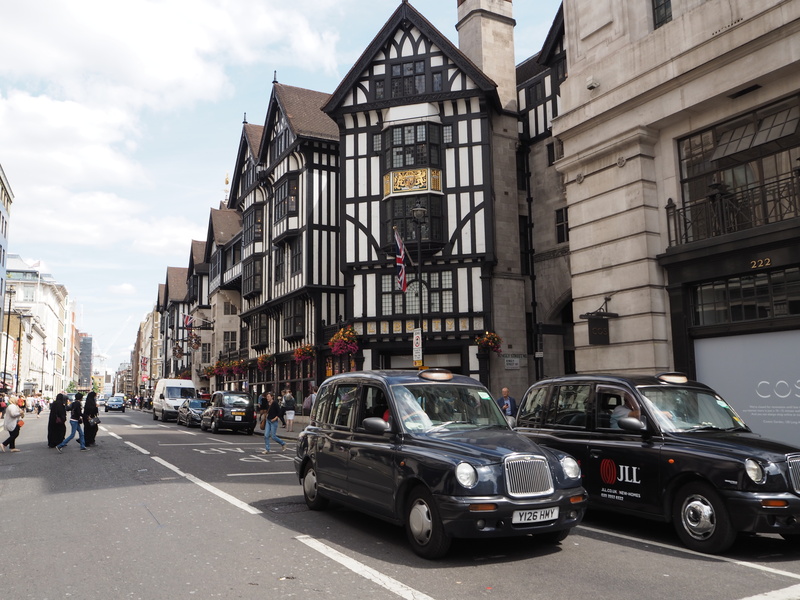 After that I headed to Soho and Oxford St, where anyone who enjoys good food and better shopping must go in London. 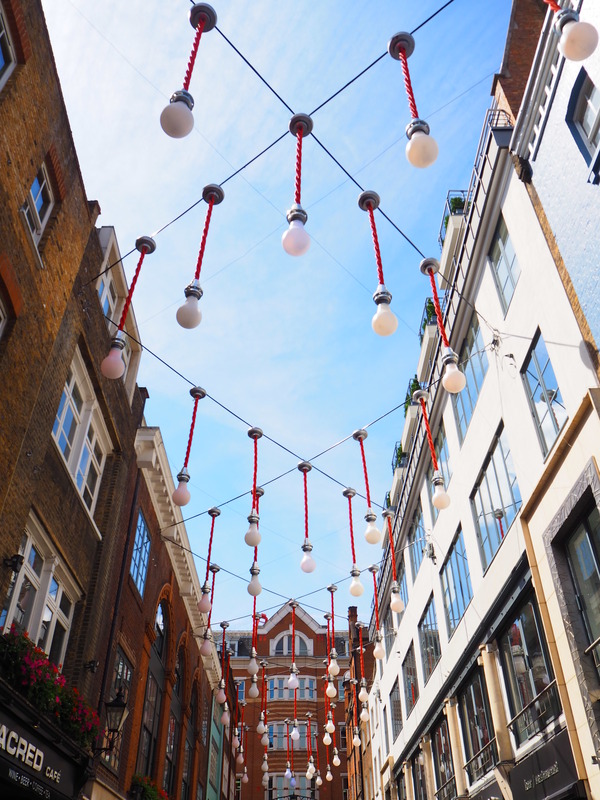 Carnaby Street in Soho has amazing boutique shops and places to eat while Oxford and Regent Streets give great shopping for those seeking the larger chain stores such as Primark and H+M. Personally I like both, so luckily they are right next to each other. 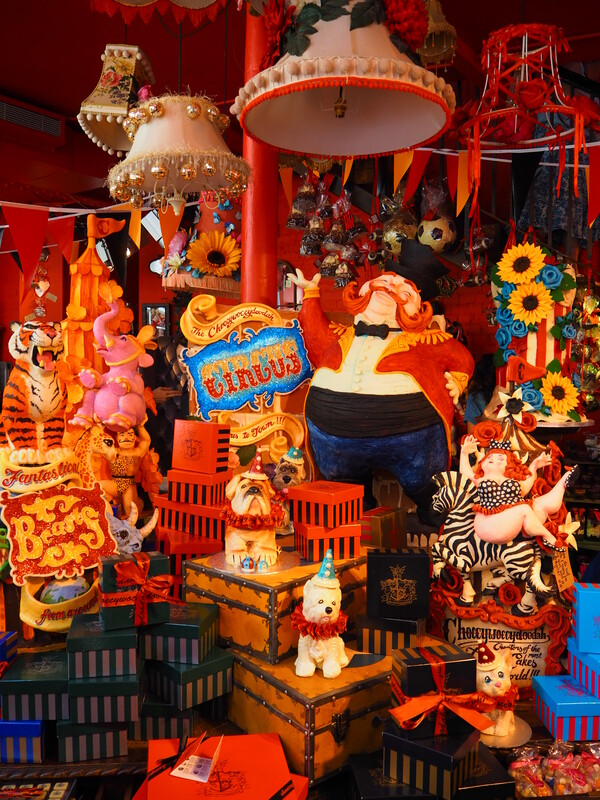 The stores in Carnaby are quite the mixture, from clothing boutiques and food to this place below, ChoccyWoccyDooDah, where all the displays are made entirely of chocolate. I didn’t stop at the cafe because of the massive lines, but they have a stores dowstairs if you want to grab a treat. THIS IS ALL MADE FROM CHOCOLATE!!!!! 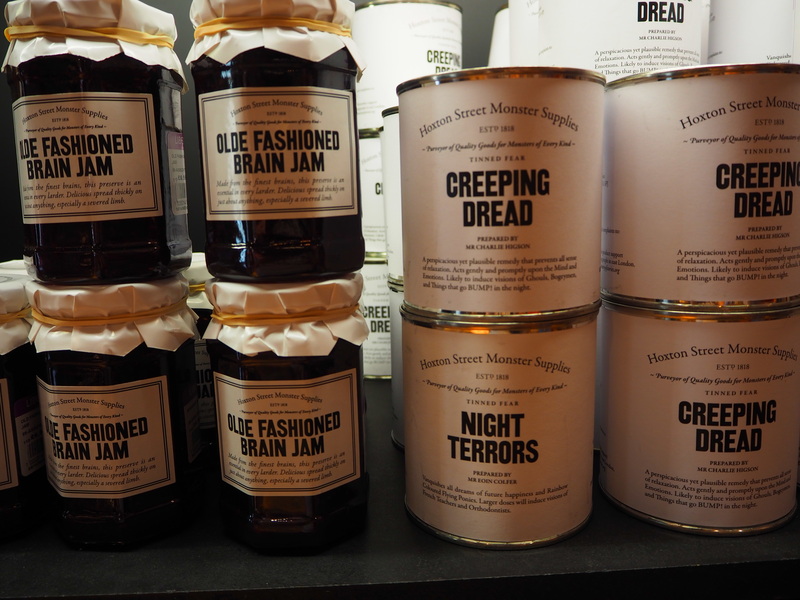 Some whimiscal foodstuffs from another store in Carnaby. The ‘Brain Jam’ was Raspberry jam. An elderly couple next to me picked up the ‘Dried Earwax’ and despite the language barrier could tell they were shocked that a place would sell earwax… until I explained it was actually fudge. Classic. 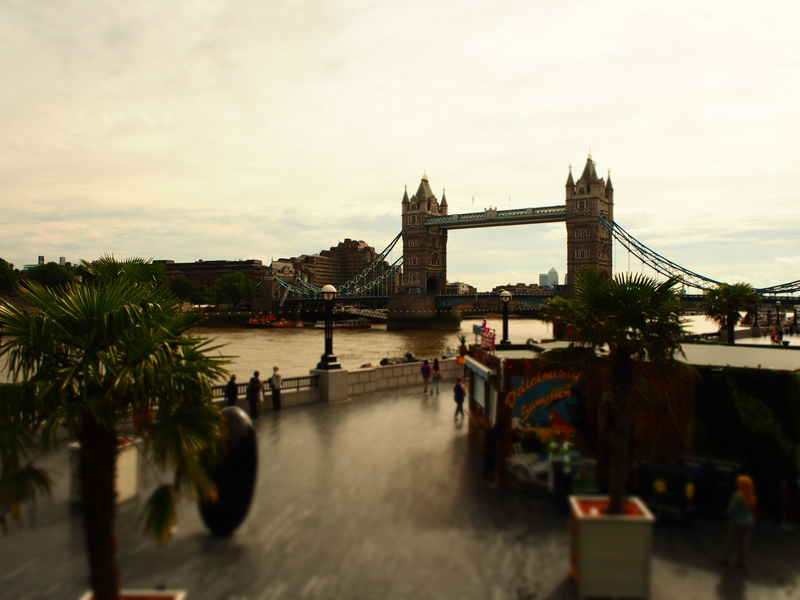 A stroll in the other direction from Borough Market and London Bridge brings you to the Tower Bridge and the Tower of London. 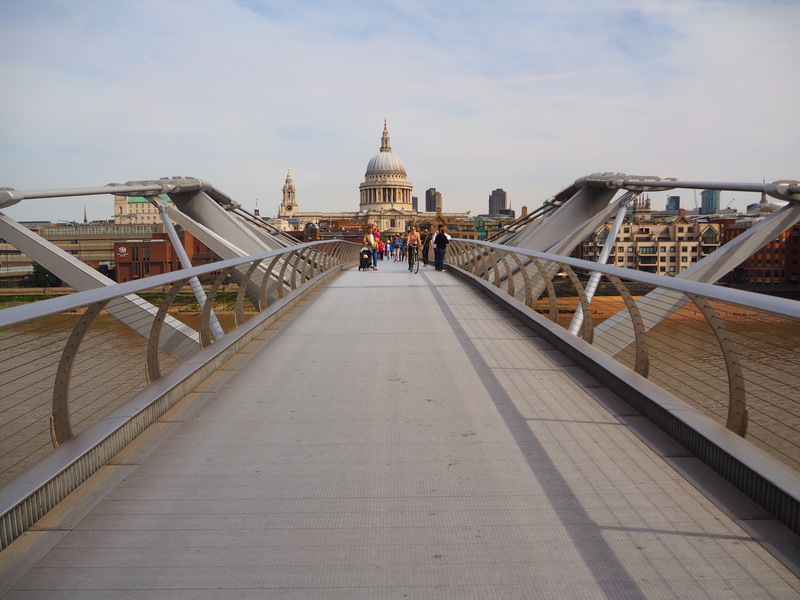 For those of us on a budget this ended up being really great, as I could walk the bridge and around the ‘Tower’ area and managed to catch a real-life jousting match all for free! Tick that one off the bucket list! 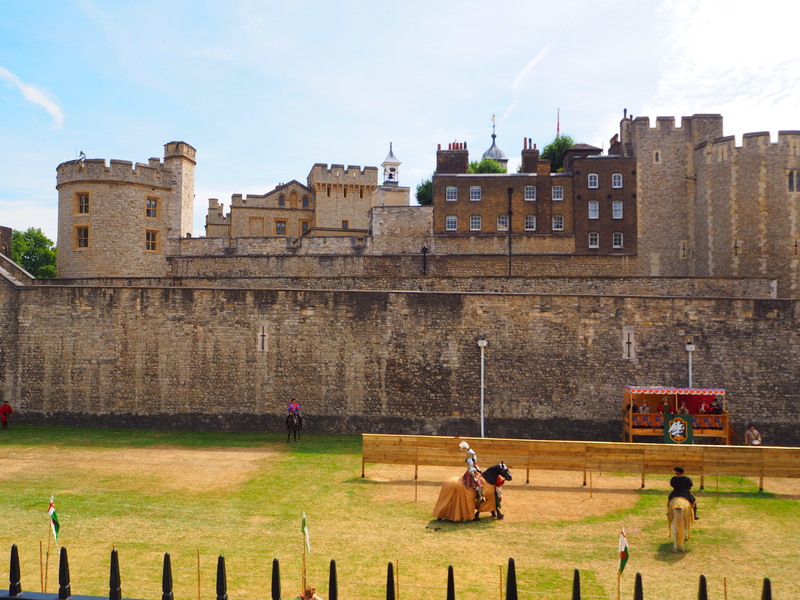 Jousting at the Tower of London! 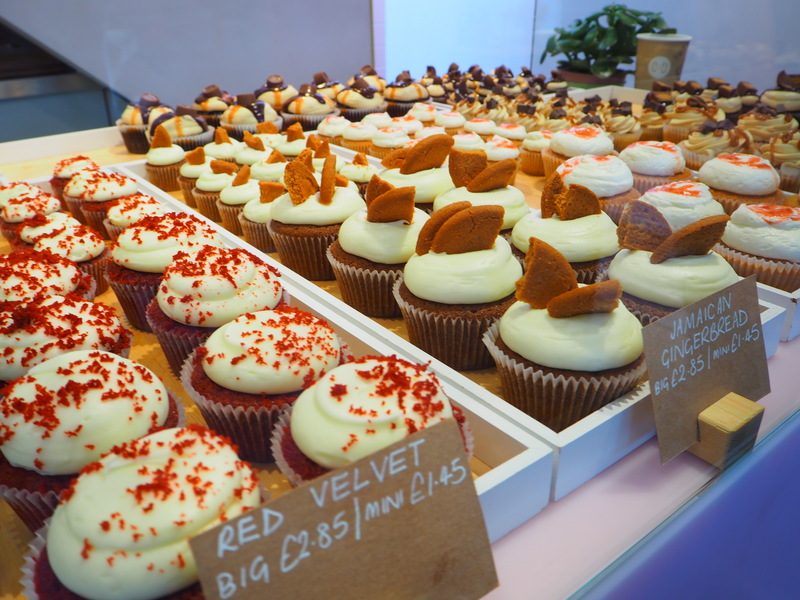 I ended my day time in London back in the Carnaby to grab one of the famous cupcakes from Hummingbird Bakery….because cake. 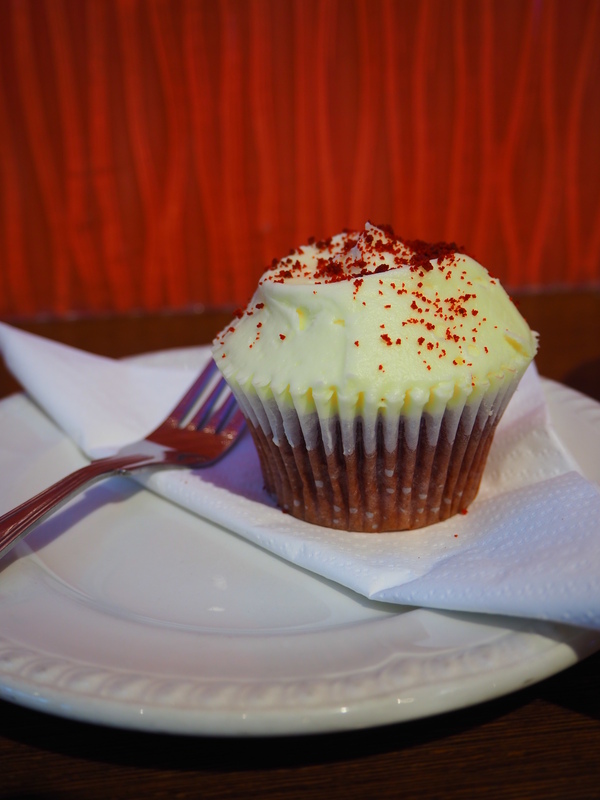 Always cake. 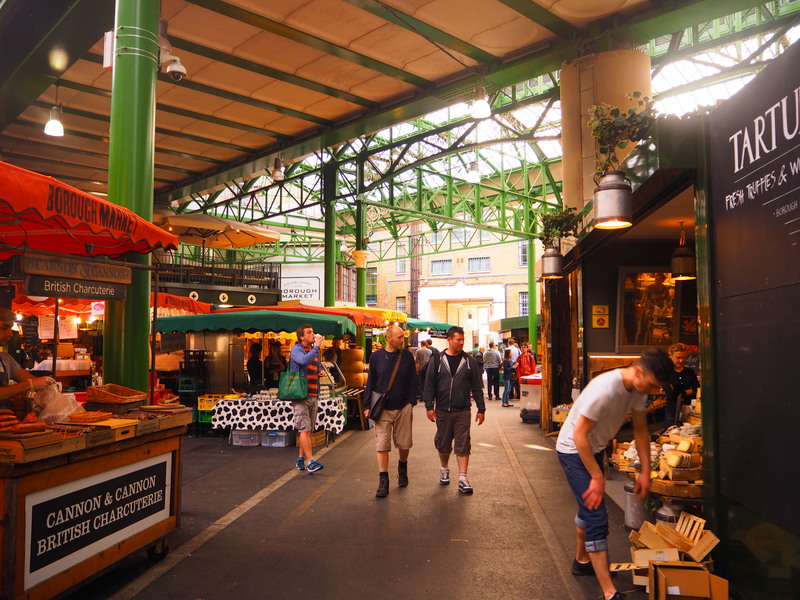 What are your favourite things to do in London on a budget? Let me know in the comments! Morocco is a photographer’s dream. From colorful crafts and beautiful food and landscapes to stark and intriguing traditional to breathtaking nature, there is a plethora of Moroccan adventures to be had. On my journey I went into the Sahara and stayed in a Berber tent drinking ‘Berber whiskey’ (very strong tea), had my nasal passages assaulted by the tanneries in Fes, and was awe-struck by the beauty of the all-blue Chefchaouen. I hope the photos I took below are enough to inspire you to go, if you weren’t already planning it! Where else should I visit in Morocco? What’s your favorite spot? Let me know in the comments!